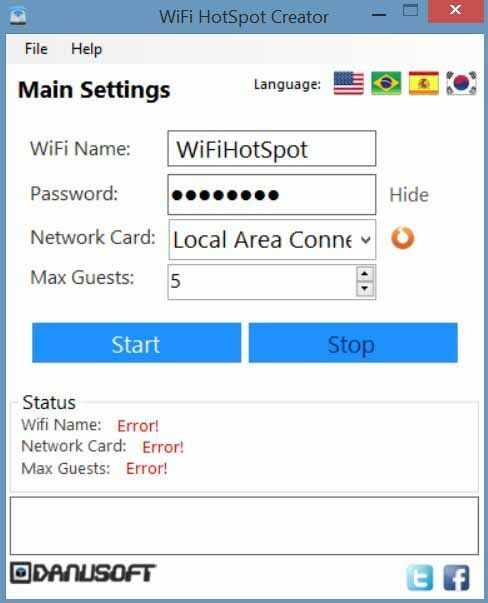 Free download WiFi HotSpot Creator latest version. It is a computer utility that enables you to create your computer device into a WiFi HotSpot. WiFi HotSpot Creator is developed by Danu Soft. This application is absolutely free and you can install it easily from this website. WiFi HotSpot Creator is full will ads supported programs. When you will start to install it, it will ask you to install different software. You can skip all one by one or can install any of them. Anyhow, these programs, that are asked during installation, are not necessary for WiFi HotSpot Creator. After installation, it will start the actual installation. You can download the setup file from the download link given below. This program is very light weight and easy to download and install. If you are running some antivirus on your computer such as AVG Antivirus or any other, it may be show this program as malware or virus. Just neglect it and allow it with your antivirus. If your antivirus delete it automatically, you can temporarily disable your antivirus. I have tested it on my computer, so it is secured. To enable the WiFi HotSpot into your computer, your computer must be connected with Ethernet cable with your LAN card. Because there is only Local Area Network Option. You can assign your WiFi Name, Password and Maximum Guests or users that are allowed to connect with your internet. After configuration, click on Start button and wait. After successful connection and creation, you can see the status just below. If there is some problem with your internet connection, then it will show error below. If you are using USB internet Device such as EVO device (Pakistan), then it will not work. This WiFi HotSpot Creator can only be connected to Network Card. If you want to disconnect this WiFi HotSpot, click on Stop button to terminate it.